Is your pesky BMW M12 inline four not cranking out enough power? Today is your lucky day! 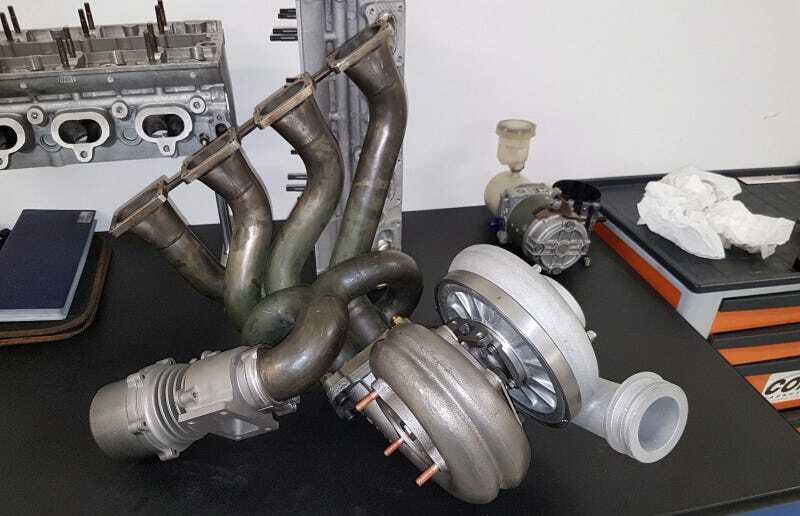 The full kit for a Garrett turbo as big as your face from a 1986 BMW Formula One engine is up for sale on eBay for just £8,750.00, or $11,854.15 in ‘Murica Bucks. It’s hard to think of a cooler ex-F1 part than this. Turbo kit installed on a Megatron M12. BMW pulled out of F1 after the 1986 season, but their turbo inline-four M12 engines were still used for a few more years until F1 ultimately banned turbochargers after the 1988 season. After BMW left the series, the M12 was rebranded as a “Megatron,” which is perhaps the best name in racing. I will never get tired of saying the name Megatron. This kit has everything you’d need to boost your vintage BMW or Megatron engine: a Garrett Motorsport 247 maram-shaft twin-scroll turbocharger, an inconel tubular exhaust manifold, and the corresponding Megatron external wastegate. Go forth, and fix that misbehaving F1 engine—or if you somehow missed out on the Megatron fire sale years ago, at least you’ll have the best centerpiece ever for your dining room table.